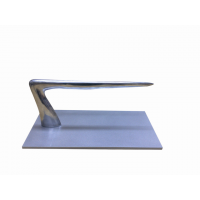 904 Floor footrest in satin-finished stainle..
9102C 50 Footrest in chromed metal. Dimensions W60 D3 H..
913 Floor footrest in polished aluminum with enameled metal plate. Dimensions W40 ..